NOVICA is one of the leading fair trade artisan websites. They work with National Geographic to give talented artisans around the world a place to express their artistic talents and provide access to the world market. Emilee from Deals of Sweetness had a chance to review the shopping experience on NOVICA and was amazed by the artistic talent of the artisans. She loved the unique experience of having her ring shipped straight from India with a postcard and message from the artisan. 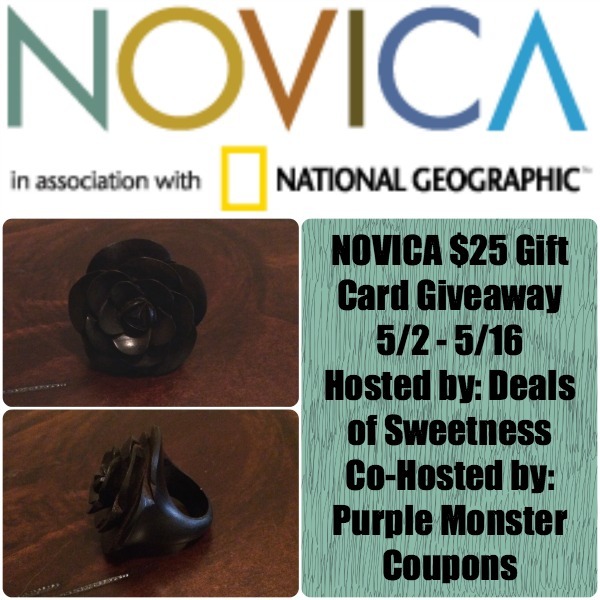 Check out her full experience in her NOVICA handcrafted wooden ring review. Artists are never aware of how good their work is. I find the more modest the artist the better the piece. This is your chance to win something special! About the prize: One winner will receive a $25 NOVICA Gift Certificate. About the giveaway: This giveaway begins on 5/2 at 7pm and ends on 5/16 at 11:00pm (times are Central) and is open worldwide ages 18+. Please refer to the full terms and conditions in the Giveaway Tools. Disclosure: Emilee from Deals of Sweetness received free product(s) to facilitate their review. No other compensation was received. Participating bloggers are not responsible for prize fulfillment.